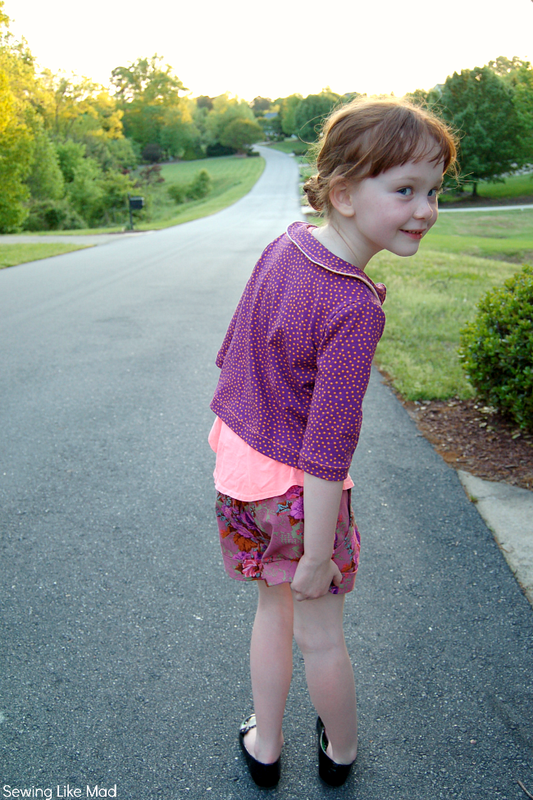 Sewing Like Mad: The Aster Cardigan + The Clover Shorts by willow & co. The Aster Cardigan + The Clover Shorts by willow & co. I am going to continue showing you what I have been doing the last couple of months....testing willow & co-patterns. 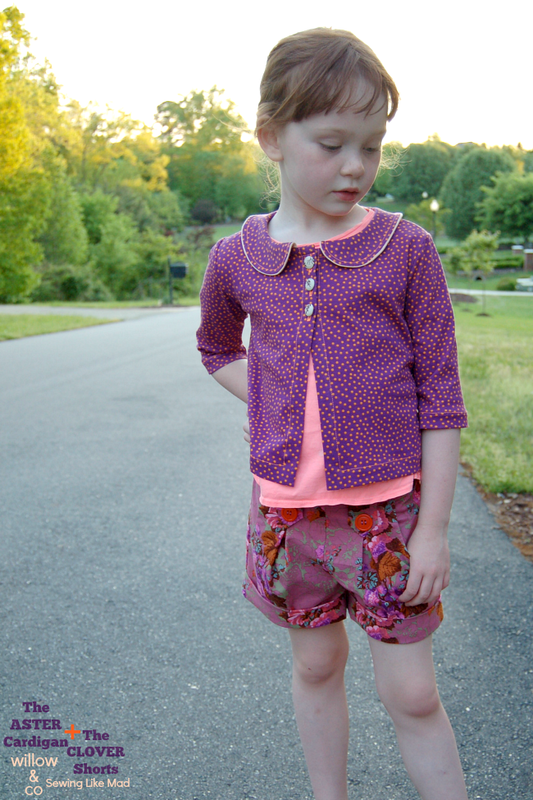 Today I am showing you both the Aster Cardigan by LBG Studio and the Clover Shorts by Mouse House Creations. Both patterns are the fast kind but both with a great and 'finished' looking result. The type where you immediately get 10 new ideas for versions when you finished one. I love those type of patterns (together with the complicated ones, ha). The Aster Cardigan is made for mid weight knit with limited stretch (around 25-25%).....so types like interlock, French Terry etc are perfect. That makes doing stitches and button holes almost as easy as if you were sewing in woven (phew). 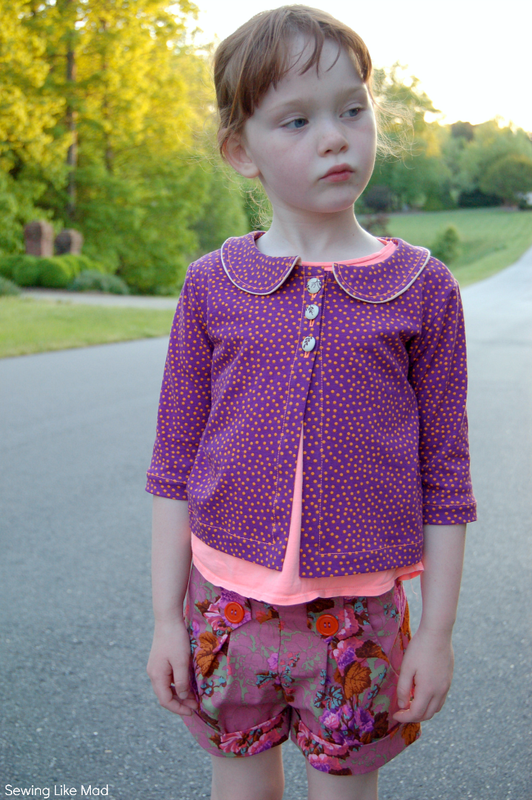 It has the cutest Peter Pan collar and has an option to add a faux piping as you can see here. The model is cropped and has 3/4 sleeves.....in other words PERFECT to wear with dresses or shorts for a chilly summer day/evening.....OR entering public places anywhere in American where freeze blast temperatures apparently are the only option in summer, (whyyyyyyyyy?) Okay, rant over! The Clover Shorts have side pockets, front pleats, a cuff, belt loops, elastic waist and options like a waist ruffle and a sash. These are made from quilting cotton and the fabric was Wilma's choice. I sort of have a love/hate relationship with this fabric but I must say I love how it looks in this model. I am obviously dying to make some in some color block versions in some thin corduroy, denim etc which is even more my style. BUT for now I am just happy that Wilma is thrilled with her new shorts. BUT do you know what is even MORE exciting than me posting about Aster and Clover? Yeah, I know....that is a tough one to beat, ha. Did you also drool over the amazing fabrics that the models were sewn in? Well, from today you can buy most of that fabric in our shop. The quantities are extremely limited so hurryyyyyyy. The quality on the other hand is unlimited. I sewed the Lily Fawn and Hawtorne samples for the lookbook and I can honestly say that the fabric is TOP quality and a joy to sew with (and look at!). I can highly recommend it, really! Here is a link to our SHOP where you of course also can buy all the amazing willow & co patterns including the ones I have showed you today. Love the look! I can see what you feel about the shorts fabric print but I think it does look gorgeous sewn into the Clover. beautiful! i love the shorts and i'm sure you made one little girl happy! you know i love these!!! and the fabrics are perfect. I am so with you about freezing temperatures in public places. WHY??? Sigh. On the positive note, the outfit super super cute. I love it! so, so cute! love the whole outfit :) and i'm opposite from you - i hate when the heating gets cranked up in the winter but love air conditioning! Perfect outfit! 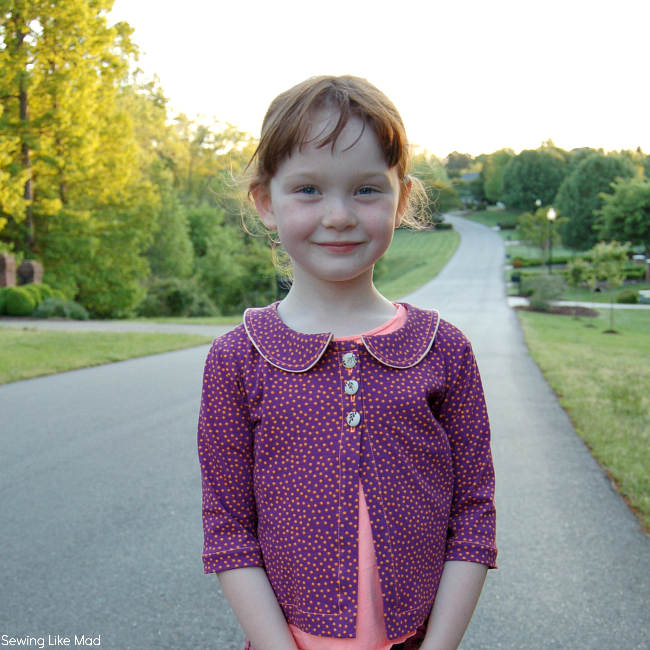 i love it when kids get to choose what fabrics are used for their clothes :) Both patterns are on my To Buy list! The colors, fabrics and model are just too perfect. I also love both of these patterns and if my daughter wore shorts more often, she would have multiple pairs of these!